“All too often, we take for granted the gifts of nature that surround us everyday.” With her camera, Sally Hanrahan captures images that move the spirit and imagination, and marries those images of spiritual, natural, and rugged beauty with the changing of the seasons. Originally from Michigan, Sally’s interest as a photographer came at the early age of fifteen. Her parent’s love of nature influenced her appreciation for the beauty and serenity that Mother Earth created. Her Grandmother’s love of photography and her Mother’s amazing talent with oils and watercolors brought to life the landscapes she yearned to visit. A self trained photographer with a natural talent, Sally has been capturing landscapes for 30 years. 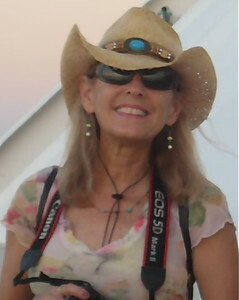 Her pictures were shown at the 2007 Sierra Autumn Photo Exhibit at Bartley Ranch and won the 2nd place People’s Choice Award for ‘Fall at Caughlin Ranch.’ Sally took First Place in two categories for the Nevada Magazine’s 2011 Great Nevada Picture Hunt and Runner-up in the Event category in the 2015 Great Nevada Picture Hunt. She has won numerous awards for her photography and has many of her works in private collections. She has shown ‘Fighting Mustangs’, a tribute to the wild horses of Nevada, both at the Artistic Viewpoints Gallery in Gardnerville, NV for the Wild Mustang Exhibit, and at the Truckee River Gallery in Reno for the ‘Art of the Horse’ exhibit. She was among those who showed at the Patagonia Outlet for the Winnemucca Ranch fundraiser. In addition, Sally has presented her photography for the Nevada Land Trust Fundraisers at Rancho San Rafael Wilbur D. May Museum. Sally moved to Reno in 2006, and devotes her high energy and free time to hiking, biking, snowshoeing, kayaking, fishing, and anything having to do with the outdoors. She has worked as a landscape designer for over 25 years and is especially fond of vegetable and perennial gardens. The landscape is her pallet and her camera is always hanging from her shoulder ready for the next breathtaking shot.